Here is the view northward on April evenings. At present the Big Dipper is high in the north. Notice the two outer stars in the bowl of the Big Dipper. These two stars – called Duhbe and Merak – always point to Polaris, the North Star. Polaris is special because it always stays in the same spot in the northern sky. 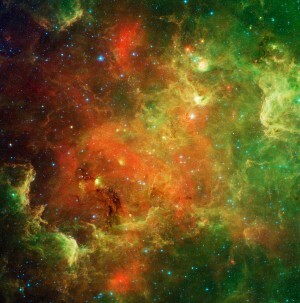 It is the star around which the entire northern sky appears to turn. That is because Polaris is located more or less above the northern axis of the Earth, and the wheeling of the stars across the dome of night is really due to Earth’s turning, after all. Polaris is also fun to locate for another reason. It is part of a famous – though elusive – star pattern, known as the Little Dipper. 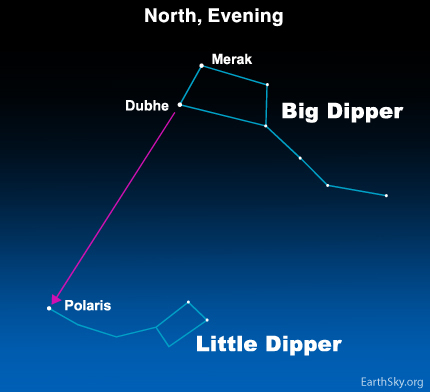 If you have ever looked for the Dippers, you know that the Big Dipper is usually easy to find. However, the Little Dipper is much tougher, partly because it is fainter, and partly because its shape is not nearly as dipper-like as its larger counterpart is. So here it is! The Little Dipper! The North Star, Polaris, marks the end of its handle. Site contents copyright © 2019 Recorder Online	except as noted. All rights reserved. | 88 queries in 2.071 seconds.